Spasticity is sometimes undesirable and problematic phenomenon following head injury, stroke , spinal injury or multiple sclerosis. This excessive amount of muscle tone which can be very difficult to cope with either in the upper limbs or lower limbs. If not treated and managed in the early stages this can lead to deformity and muscle shortening which may lead to the need for surgical management. We believe that management of spasticity must begin with accurate assessment and measurement of the phenomenon, before commencing any course of treatment. We use Electromyography(EMG) to determine the muscles that are problematic and hinderance to function/ posture , and pre injection or assessment appointments are always multi disciplinary , where we are able to assess objectively , treat and provide recommendations and aids( splints ) for after care all at the same time. All our injection procedures are EMG and Ultrasound Guided so we are certain that the muscles we intend to treat are targeted. 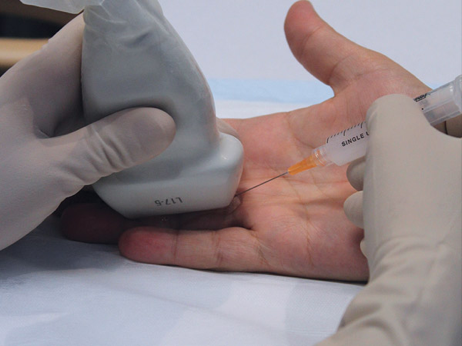 Our clinicians undertaking this procedure regularly update themselves with current advances and are working towards CASE accredited Ultrasound Awards which would enable them to extract very meaningful information about tissue and joint changes during or before the procedure which can be used to assess effectiveness and Clinical Outcomes at repeat appointments. There is no instant cure or formula , but we strongly believe that a multi disciplinary approach gives us the best chance of dealing with this sometimes very refractory clinical phenomenon. Our team led by Consultant in Rehabilitation Medicine are specialist in managing spasticity which may include medication changes / recommendations , EMG assessment, Botulinum toxin injections, gait analysis, orthotics , splinting and electrical stimulation.